You probably have heard a lot about anchor text, so let’s start making a point here: this isn’t what we are going to talk about. Anchor text is, according to MoZ, the “visible, clickable text in a hyperlink”, one or a couple of words that you create to call for an internal and external link. It is one of the most important SEO elements, as both your visitors and search engines check them for keywords and useful content. On the word hand, anchor content is a new term, created to name the type of content that distinguish itself from its competitors by its uniqueness and authenticity. And, for many experts, it is the key to content marketing success. So let’s see why, and how you can create it and benefit from it. Why is Anchor Content better than others? The secret behind the importance of anchor content is that it allows you to be seen as an authority. Only an expert can write anchor content, as it requires knowledge and experience in that particular industry, and any audience knows it. So if you manage to add this type of content to your blog or website, it will start to be perceived as authoritative immediately. And it means good news for your SEO, traffic, and conversions, all in one go – that is to say that anchor content becomes not only more important than SEO but the reason behind its success. While it is very hard to find something completely unique on the web nowadays, it is thanks to the fresh perspective offered that people follow some blogs instead of others. They know that there are millions of reviews out there, but they read or watch that guy reviews because he adds his own point of view to it – and they also follow his opinion, as you know. High-quality content is easy to read. Despite the fact that many people think that experts should write in an almost obscure way, one that only the chosen ones could grasp, it isn’t true. Statistically, the most successful posts are simple to read, and they “translate” complex topics so people can follow their instructions without the risk of misunderstandings. Rest assured that nobody ever conquered an audience by intimidating people. Every single anchor content – and every single word in it – is created based on deep research. If you want to know that what you got done will be seen as authoritative, consider how much time you spend preparing it – and I mean, before writing a word. Of course, if you are an expert, you will be able to write amazing posts out of the top of your head. But it means that you have been preparing yourself and accumulating knowledge over the years, right? The relevance of your content is also essential to tell if we are dealing with anchor content or not. It is the same principle on which Public Relations works called newsworthiness. If nothing something isn’t newsworthy, it won’t make the national news. Same way, if your content isn’t relevant, you will be lost on the web. Of course, it is a relative concept, as what is relevant for me, might not be relevant for you. So the secret here is to find out what your target audience considers as relevant. More specialized is your blog or website, better defined it will need to be in your mind and content marketing plan. As you noticed, not a word was said above about the length of your post. You can create anchor content with either 500 or 2,000 words; there is no definitive guideline about it. The point is that you use the number of words that you need so to write something authoritative, and that is it. 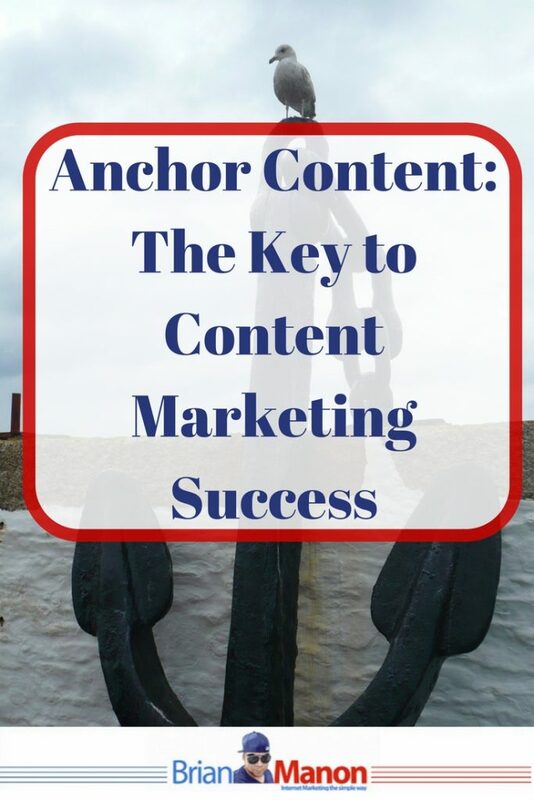 Creating anchor content is easier than you think. All you have to do is to make sure that the elements above are all there for anyone to see and label your post as authoritative. People love to hear stories. We relate to them more frequently, as they are what we learned to take seriously in order to survive during ancient years. But it isn’t any story that will help you set your post as anchor content, but one remarkable and that help you to prove your point. It will also make your idea easier to understand, by boosting association and analogy. And if it is a personal story, it will let your visitors know how come you learned about those things, making you sound a more reliable source. By mentioning other experts in your post, you will show that you have done enough research. You read, you watched, and you select what was important to mention. It will also demonstrate that you have tried to confront your point of view with other specialists, instead of considering them as competition. And that you are up-to-date with the news of your industry. So make sure that you add a few quotes from authoritative sources and links to their blogs and websites on your posts. It is not only on your blog that you should sound like an authority. It is everywhere, social media networks included. So make sure that you spend some time posting regularly on social media networks where your target audience uses to hang out – and this is how you avoid getting overwhelmed by joining every single social media network available. You also must have an active LinkedIn profile, and answer questions regarding your industry on Quora and Reddit. It will also allow you to increase your traffic as you will be sharing your content on yours profiles and pages. And it is not only on your blog that your posts should be seen. You should also consider been featured on other websites as a guest blogger. This way, you will be reaching a larger audience and spread your name over the internet. Of course, you don’t have time to waste, and the majority of blogs wouldn’t pay you a penny for your posts. So make sure that you choose them wisely, considering the high-quality traffic that they can bring to you. If you have some troubles with content creation, you may check some helpful tools like a Coschedule, All Top Reviews, Hemingway. Another thing that you should always do it is to add statistics to your content. As strongly as a quote from experts, they can prove that what you are saying is for real, not something that you have just made up. To avoid that it backfires, make sure that you only use numbers from reliable sources, and that your data is recent. Avoid just copying reports and have a look at the raw data to reach your own conclusions. After doing it, take it to the next level by creating an infographic to showcase your results. Visual resources will make complex topics much easier to understand, and your visitors will thank you for that. At this stage, some of you might be concerned about a sad truth: if you can’t call yourself an authority, how can you create anchor content? First of all, make sure that you aren’t suffering from impostor syndrome. It is much more likely that you know more about your industry than the average visitor of your blog or website, so you are covered. Just keep studying and improving your knowledge, sharing only the topics about which you feel more confident. According to Brett Relander, it is all about being “knowledgeable and passionate about your topic”. The founder of Launch & Hustle also suggests that you take the time to conduct thorough research. And if you know that you just can’t do it, you can always hire someone to write content for you. Or interview experts instead. There is always a way to create anchor content without offering poor information, and you will find yours. As you noticed, anchor text isn’t any unspeakable or unknown thing. It is just authoritative content capable of taking you the first page of Google Search. It comes with a fresh perspective, lots of research, perfect readiness, and extreme relevance to your target audience. To achieve it, you can tell stories, add infographics full of reliable data, write guest posts, and become an authority on social media. And even if you aren’t an expert (yet), you can get the work started anyway. So make sure that you review the content that you already have on your blog or website and see how you can improve it. And from now on, only create anchor content. Your reports will show better results sooner than you think. I don’t really have anchor content on my blog, but I do share personal use-cases for specific tech configurations which seem to resonate with my readers. I’m not really an authority on those technologies, but many people identify with and share my need for using them the same way I do. I think this may be another form of anchor content, what do you think? Getting to the first page of google is every blogger’s dream. These are awesome and practical tips to create anchor content to establish authority in our niche, so we get to realize that dream. Thank You! !